Where do expats eat in Paris? Early morning coffee and croissants, long leisurely lunches, and high-end dining at some of the city's culinary hotspots are all going to be part of your Parisian adventure. 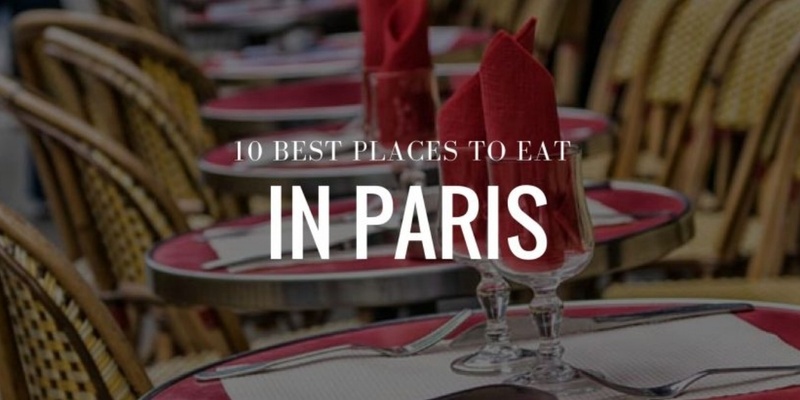 While great cafes and restaurants can be found right across the city, our guide points you to the 10 best places to eat in Paris, places favored by both locals and visitors alike. With its arty bohemian atmosphere, Montmartre (Paris 18th) is a tourist's delight but if you look beneath the surface you'll find plenty of bistros and restaurants that the locals visit again and again. Start your weekends with an Aussie-French-style brunch at the trendy Hardware Société then, for Italian lunchtime flavors, Al Caratello can't be beaten. With its generous food portions and sharing platters of seafood and pasta, it's a great destination for families. Le Coq Rico celebrates everything to do with poultry and game, serving adventurous takes on pigeon and guinea-fowl along with French chicken classics such as coq-au-vin. For an occasional treat head to the award-winning establishments that line the Champs-Elysées (Paris 8th). At the high-end of the budget are Alain Ducasse au Plaza Athénée and Le Cinq, headed by Christian Le Squer. Located at the Four Seasons Hotel George V, the latter has held its three Michelin stars for an impressive twelve years. A little lighter on the budget but still serving deliciously high-end food is Jérémie. Finish your meal here with its house specialty of Bourbon Vanilla Mille-Feuille. When your taste buds crave the spicier flavors of the east, then Belleville (Paris 20th) is a neighborhood known for the excellent quality of its Vietnamese and Chinese restaurants. Maybe the best known are Tin Tin and the long-established Lao Siam which also serves up the traditional dishes of Thailand and Laos. Crossing the world to South America, Colombian food is also represented in Belleville at Múkura while vegetarians will find plenty to enjoy at Zoé Bouillon, the perfect place for healthy food on the go. The trendy Left Bank is home to an eclectic choice of dining from the excellent fish dishes created by TV chef Yves Camdeborde for his tapas bar, L'Avant Comptoir de la Mer to heartier cuisine in the elegant bistro surroundings of Sauvage. Little Breizh transports you to Brittany with its country produce and dishes. And, of course, you can't visit this district in the 4th arrondissment of Paris without popping into Café Ladurée for an afternoon cup of tea accompanied by a colorfully glossy macaron. The Haussmanian boulevards of this 9th arrondissement of Paris have started to sport new dining opportunities in recent years. Le Bookie is a pizzeria with a justifiably deserved reputation for its generously topped pizzas while the crescent-shaped pizzas that hale from Corsica can be enjoyed at Papacionu. Traditional Mexican burritos accompanied by large glasses of fruity sangria and the chunky burgers of Le Camion Qui Fume are great lunchtime choices while upmarket yet chic food can be found in the sophisticated surroundings of Le Richer. Exploring the food of Le Marais (Paris 3rd) is best done in the evening as you move leisurely from bar to bar. Soak up the beer with falafel-filled pitas at L'As du Fallafel or dainty Mexican tacos at Candelaria. Carry on through Candelaria to the quirky surroundings of the speakeasy-style cocktail bar at its rear. Le Marais is also noted for its raw food and vegan establishments. The menu at Le Potager du Marais is 100% vegan while the uncooked vegetable dishes at Raw are always artistically presented. Finish off your evening with an ice cream or sorbet from Une Glace à Paris. You also can go to The Peloton, one of our favourite coffee shop in Paris. Although not easy on the budget, the Louvre and Palais-Royal districts (Paris 7th) should be experienced for both the high-end dining and the choice of Japanese restaurants. With its fusion of Chinese and French cuisine paired with exquisite teas, yam'Tcha is riding high in all restaurant ratings while Alain Ducasse's restaurant, Le Meurice is a sure place for celebrity spotting. The slightly more reasonably priced tasting menu at Ellsworth will make you feel right at home with its own twists on doughnuts and Kentucky fried chicken. Some of the best udon and gyoza can also be found here earning it the nickname of Little Tokyo. An abundance of Japanese restaurants have appeared in the last twenty years or so but the standout names of the moment are Kunitoraya and HIGUMA. Aussie and South American expats can feel right at home dining in the Canal Saint-Martin district (Paris 10th). HolyBelly with its Melbourne-style menu is perfect for weekend brunch while golden empanada pastries are a feature of L'empanaderia, an Argentinian bistro. The international influence continues with fish and chips at the Sunken Chip, fragrant Korean dishes at SAaM, and Italian meat dishes at La Madonnina. In the Oberkampf and République district, (Paris 11th) you'll find a wealth of coffee shops and bars but it's also a place where you can embrace the flavors of the Mediterranean. Indulgent pizzas are worth the queues at Ober Mamma while vibrant colors fill the Mediterranean-inspired buffet table at Soya Cantine Bio. Famous Basque chef, Inaki Aizpitarte, presides at Le Chateaubriand while the lavish wine list at the intimate L’Îlot provides the perfect accompaniment to its seafood menu. Good-value three-course menus can be found in and around the Place de la Bastille, (Paris 11th)perfect for those days when you don't want to cook in your Paris Attitude apartment. DUNE is overseen by Seattle native Evan Leichtling while vegan lunches and dinners can be enjoyed at the Gentle Gourmet. Also here is the Caffè dei Cioppi, considered by many to be the best Italian restaurant in Paris. When you want to splash out for a special occasion, however, the fusion tasting menu at the industrial-chic Dersou run by the French-Japanese combination of Amaury Guyot and Taku Sekine is a perfect choice.